Defined as a place where time is truly immaterial, travellers in the sun-soaked crystalline beaches of Maldives have a myriad of leisure activities to engage in for a more fulfilling and exciting vacation. Amidst its turquoise waters and the sunny weather all year round, the many escapades the island offers promise its visitors an authentic island experience, showcasing a multitude of activities that are swathed in Maldivian culture and its tropical island surroundings. Perhaps the ultimate destination to embark on a fishing trip, Maldives offers its visitors an experience of a lifetime. As the tropical sunrays touch upon your skin in the midst of the balmy breeze against your hair, the island provides its guests the best setting for fishing, for both novices and fishing enthusiasts alike. A famed recreational activity, fishing is most popular among the locals as it is one of the main means of livelihood for the Maldivians. Touring the islands, one is able to see many quaint fishing villages that invite the onlookers to come experience its way of life. An appealing activity that attracts even the discerning travellers, there are many types of fishing that one can indulge in. Catering to the varying needs of the traveller’s convenience, some of the fishing types are big game fishing, resort fishing, scuba fishing, reef casting, trolling and fly fishing. The vast expanse of the ocean that surrounds the island is nothing short of spectacular as it teems up with its vibrant and diverse marine life. Making the sport of fishing more exhilarating as the lifeblood of the island’s economy, its array of fish are what fishermen and travellers find the most alluring. Its incredible marine life includes swordfish, marlin, sailfish, barracudas, tunas, rainbow runners, trevallies, jacks and dolphin fish being among the most sought-after fish. A place unmatched by other fishing destinations, aficionados and beginners can simply pack up their fishing gear and journey across the open ocean. Catching a prized fish maybe quite a difficult task for novices; however, with the help of the right fishing tools and the undeniable hospitality of the fishermen community who are willing to share their trade secrets with anyone, you will be able to catch your first fish, magnificent in all its glory. The most popular past time among locals is night fishing. An activity that involves heading out to the waters before sunset, it provides an opportunity for travellers to sink into the dark surroundings. Catching fish under the night sky will be an intriguing chapter to your vacation as the boat anchors at a reef by the outer atolls. The lines are tethered with sinkers and hooks and dropped into the reef waters from all sides of the “dhoni”, a special fishing yacht. 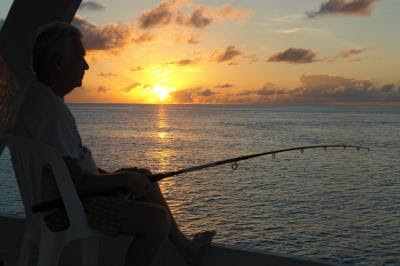 Dropped overboard, night fishing allows one to catch different types of fish, such as emperors, squirrelfish, snappers and other reef fish. An amazing experience, the gentle rocking of the boat enables you to sink into relaxation, while you wait patiently for fish to be caught, seated under a canvas of blinking stars in the night sky. You can also simply sit back on the deck of the dhoni and contemplate. Setting your bait afloat, once you have caught your prized catch, may it be the feisty snapper or stunning emperor fish, you can easily head back to shore and make your own breakfast, by simply grilling the fish by the beach. If not, you can hand it over to a local restaurant, where the chef’s trustworthy and talented hands will serve your fish back to you, cooked in gourmet style. If you are interested in embarking on a trip to Maldives, one Maldives accommodation that should be considered is Adaaran Club Rannalhi. This Maldives hotel is the ultimate tropical getaway with luxurious accommodations in the midst of the island’s unparalleled and exquisite bountiful nature.